In the many years I have been playing video games, I have very rarely found a tennis game out there that really has the right control, fluidity or gameplay to make the game as entertaining to play as it should be. Virtua Tennis however, gives you all that and a little more. Ported from the classic arcade game, the Dreamcast version is just as fun to play as the original. Virtua Tennis features several professional tennis players including Yevgeny Kafelnikov, Jim Courier, Mark Philippoussis, Carlos Moya, as well as a few secret characters. The game has three play modes including arcade, exhibition and world circuit. Depending on the mode, anywhere from 1-4 players can play in each match and you can choose from grass, clay, carpet or hard courts. 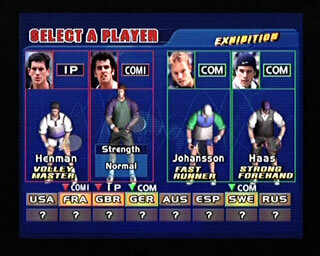 In arcade mode, you choose to play either singles or doubles play, and take on several opponents of increasing difficulty. Exhibition mode lets you choose a court, singles or doubles, customize the rules and set the length of the match. Exhibition mode is the best mode for playing multiplayer games with your friends, which is always great. The world circuit mode is where things get really fun. You start on a world map, which has a bunch of challenges in different locations. Each challenge is unique, from simple singles or doubles matches, to really fun little minigame challenges that help you learn all the ways to hit the ball, aim, etc. The minigame challenges include things like aiming at bowling pins, lobbing tennis balls into garbage cans, knocking crates off of the tennis court and aiming at a bullseye painted on the court. These are all very fun to play over and over, adding tons of replay value to the game. Throughout the world circuit mode, you will earning money, which can be used in the tennis shop. In the tennis shop you can unlock more tennis players for use in the other modes, purchase new outfits, and hire partners to play in world-circuit doubles matches. Graphically, Virtua Tennis is pretty nice. 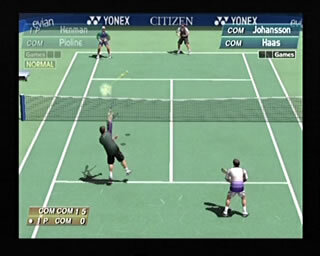 Replays show the full details of characters faces, which are very good for a Dreamcast game and the animations move with all the fluidity you want in a tennis game. The in match sounds are also done well, with all the ball, racket and footwork sounds you would expect. All around, Virtua Tennis is amongst the best of the best, all time tennis video games. A must have for any Dreamcast game collection and a must play for tennis fans. Thanks To sleeper77 from the Retro Gamer Forums for the pictures.